It’s been a little while between posts now (mainly because I’ve been lazy) so I thought I’d show you some new projects I’ve been working on, now that the Summer CAL blanket has been finished. Firstly, I’ve started the ‘Around the Bases’ CAL, which is a crochet-along that uses any feature square you choose for the centre of the blanket. 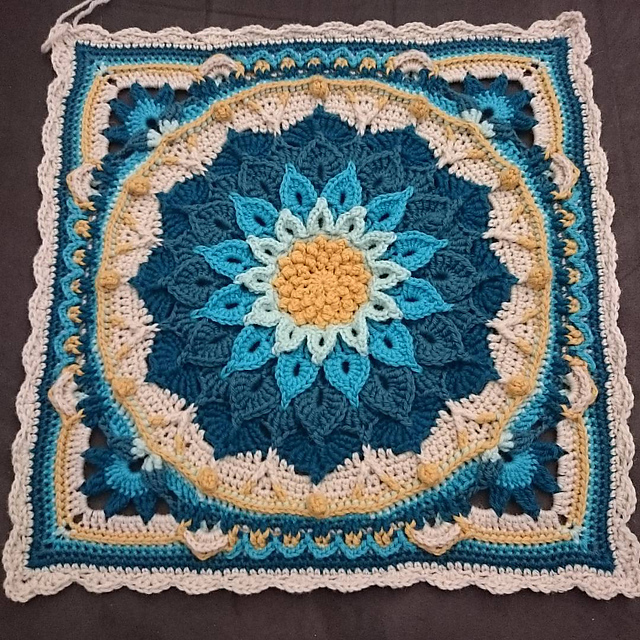 I’ve chosen the enchanted garden square by Courtney Laube, which is a nice combination of a crocodile stitch flower and Sophie’s garden square. It took a while to finish the centre square, but I’m finally onto the around-the-bases parts; currently working through the 3rd inning. 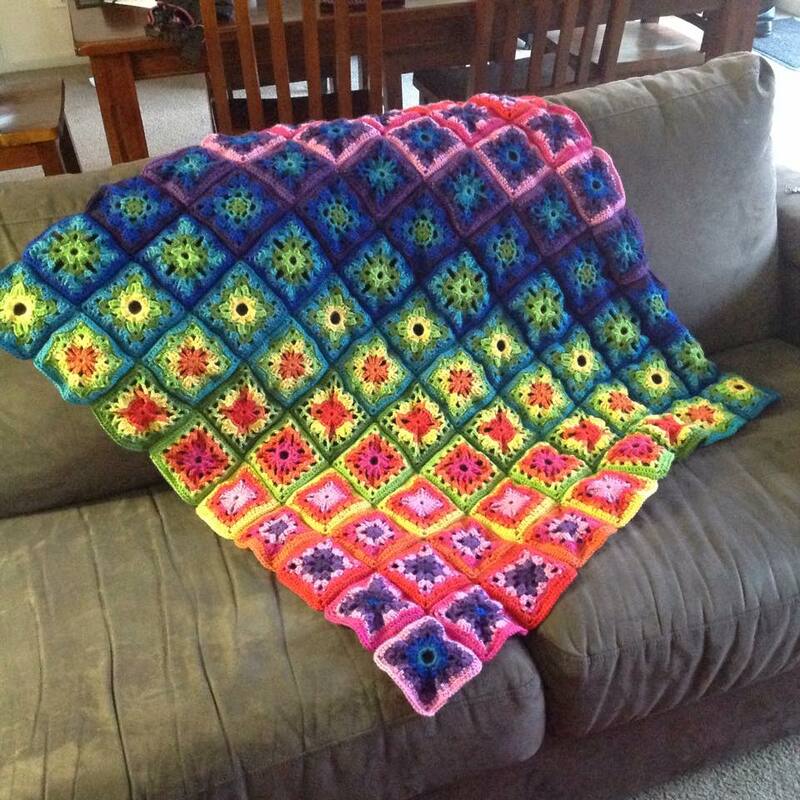 As you can see, I’m using Cascade 220 yarn again, which is what I used on the Sophie’s Universe blanket. I think I’m in love with this yarn. The other main crochet project I’m working on at the moment is a chocolate-coloured queen-sized afghan for my bed. I’m using a small square pattern from Spincushions, and the yarn is a wonderful undyed, all natural Tasmanian wool. It’s expensive but amazing to work with and I love the thought of a whole heap of chocolate coloured sheep running around somewhere! Photos of this project to come. 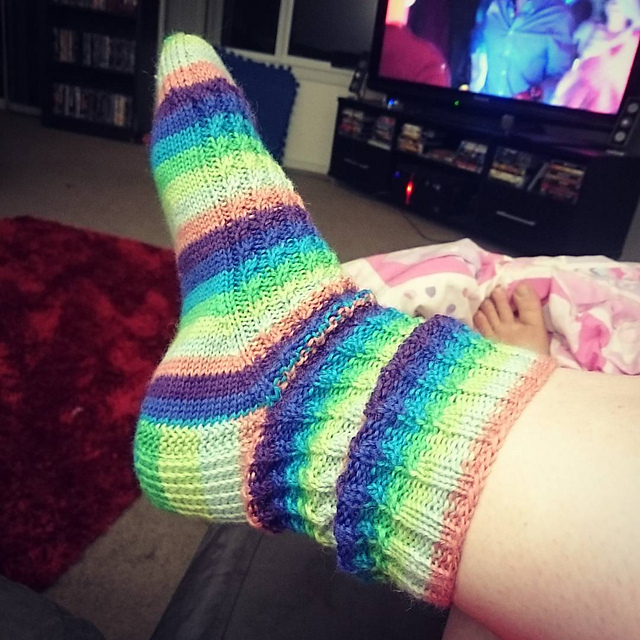 Finally….I finished a sock! The foot section alone took me all of Saturday and some of Sunday to finish, but it looks and feels great and it fits perfectly! I’m pretty satisfied to report that for my first sock and first finished knitted item, I can’t find any major mistakes. Happy days! The only depressing thought now is that I’ve still got to complete the second sock before this sock is useful, which means all of that effort all over again….sigh. 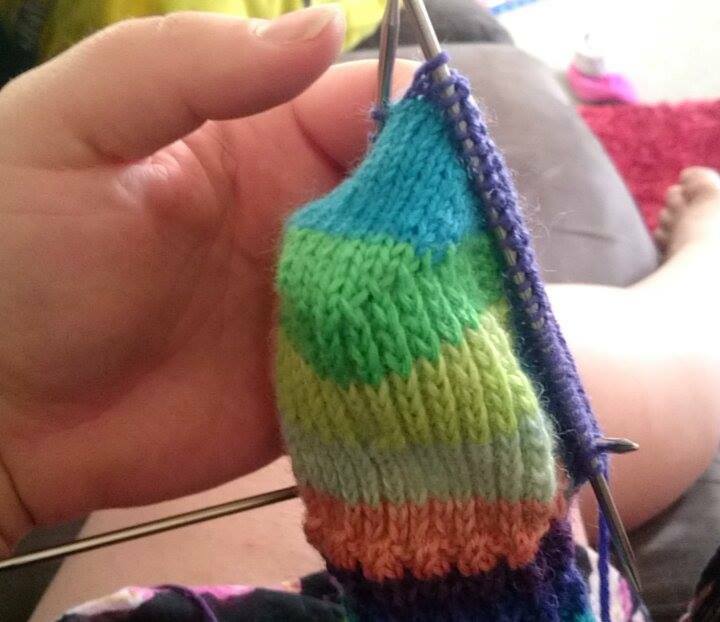 The last image below is the beginnings of that dreaded second sock. I figured I’d better start it straight away before I get scared and throw the yarn and the completed sock in my WIP pile in my office cupboard. I had another yarn-filled weekend. I should’ve been studying since my exams are at the end of the week, but I decided to have a nice relaxing weekend followed by a few hectic weekdays. My Summer CAL blanket is finally blocking, which is very satisfying 🙂 It looks lovely on my floor, and I’m sure will look just as lovely when draped on my couch after blocking (it wasn’t blocked in the lounge photo below). It has turned out to be almost as big as my Sophie’s Universe blanket, which is a comfortable lapghan size. 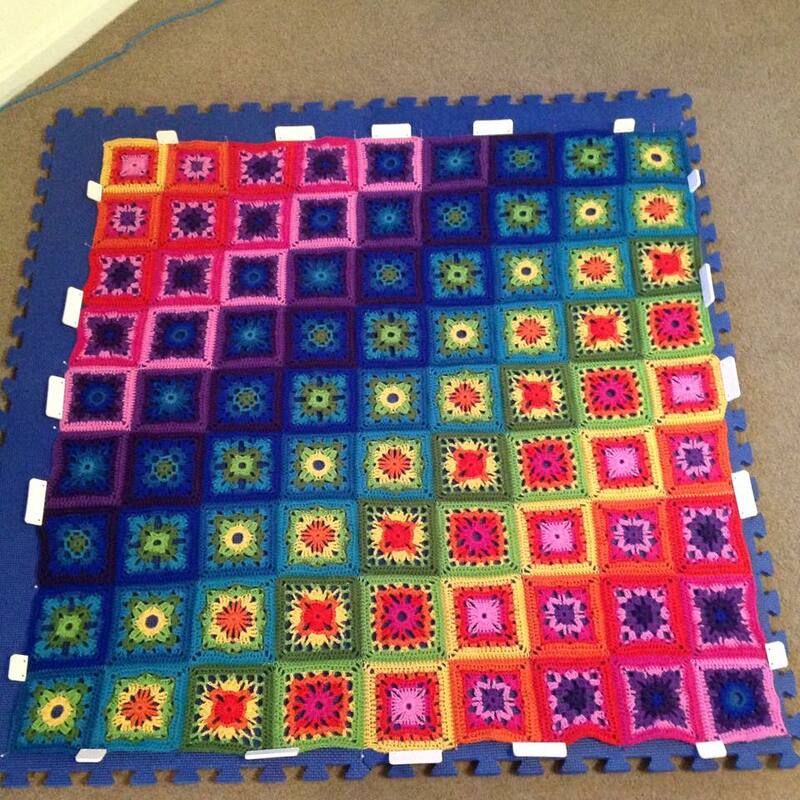 Speaking of my Sophie – it’s now nicely folded and awaiting transport to the showgrounds in just under two weeks. 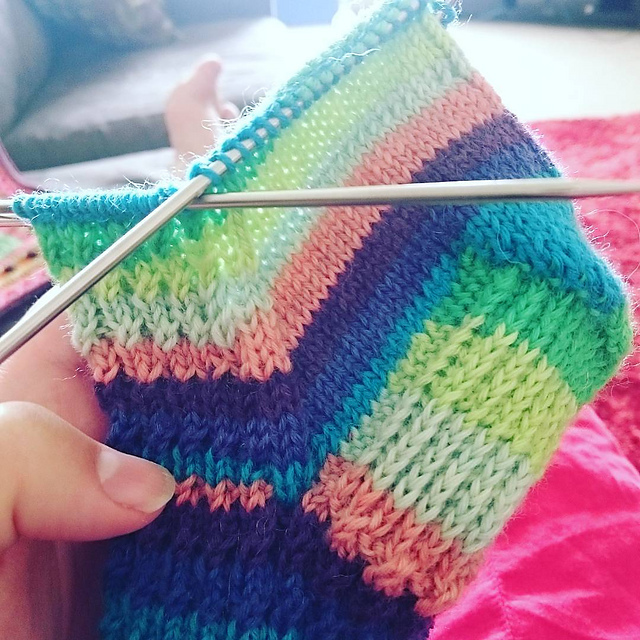 I made a lot of progress on my stripey knitted socks, and thanks to a few random questions to my mum on Skype I managed to complete the leg, heel flap, heel turn and gusset decrease. 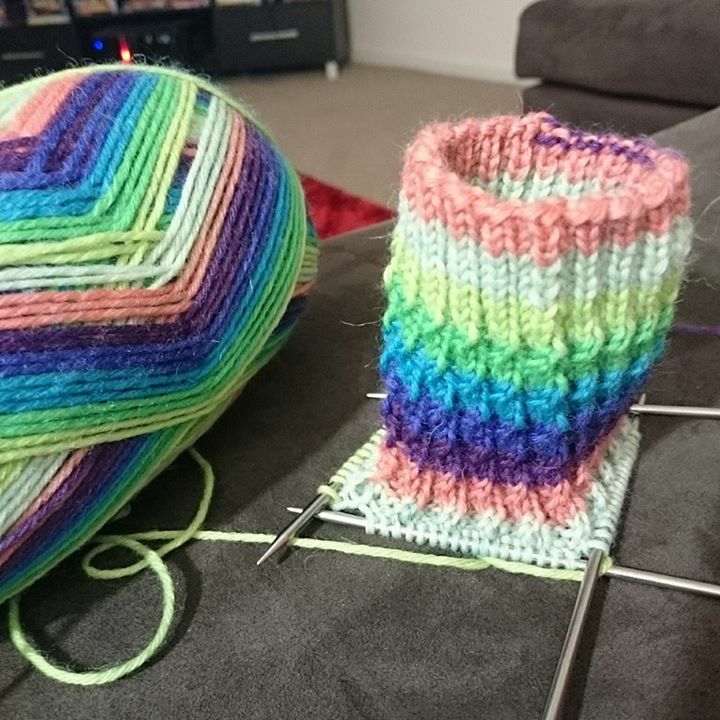 The sock is a bit more progressed than the images below show, but you get the idea – it’s definitely looking like a sock now! 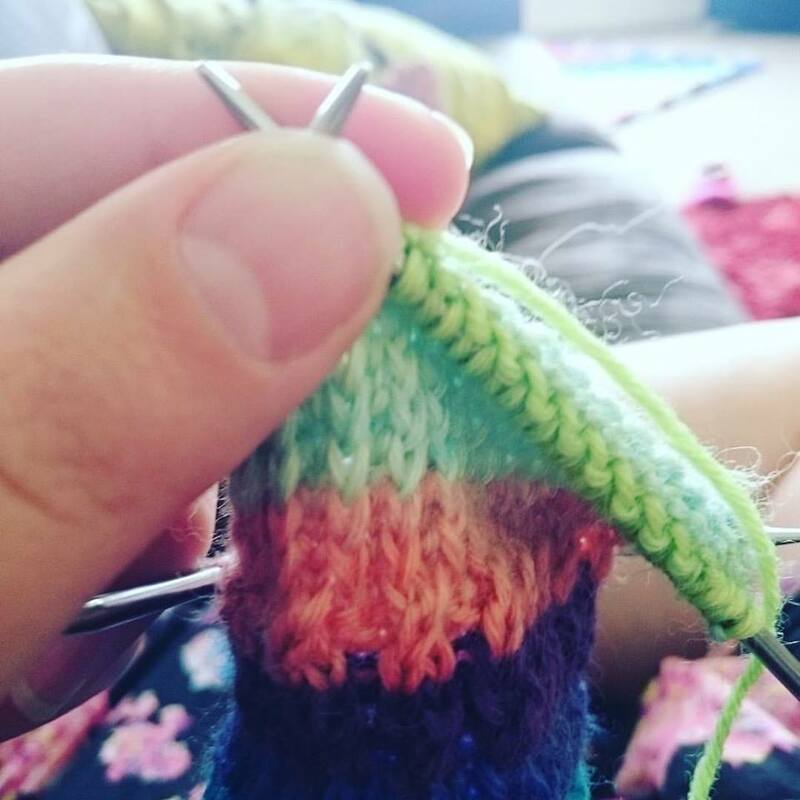 Over the last week I’ve been trying my hand at knitting socks. My mother gave me some yarn money for my birthday on Friday, and she’s a bit of a knitter so I thought I’d give it a go for something different. I bought a couple of balls of gorgeous sock yarn, some double point needles and a sock book. Mum has been great by attempting to teach me how to knit socks via skype, which is pretty difficult when you’re trying to hold the iPad in the best position for the camera while trying to awkwardly hold the needles correctly. 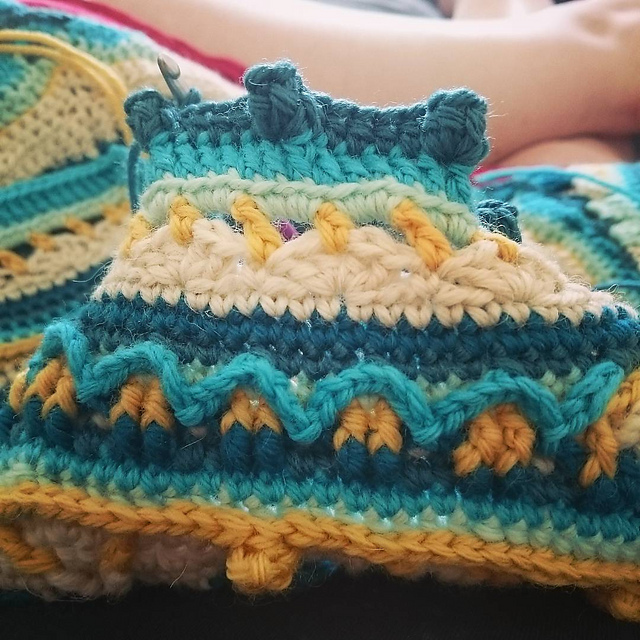 I kind of feel like I’m betraying my hooks though, and I keep calling the needles ‘hooks’! This is the first thing I’ve knitted other than a few dodgy scarves, so it’s all pretty new to me. Fun, but very time consuming. 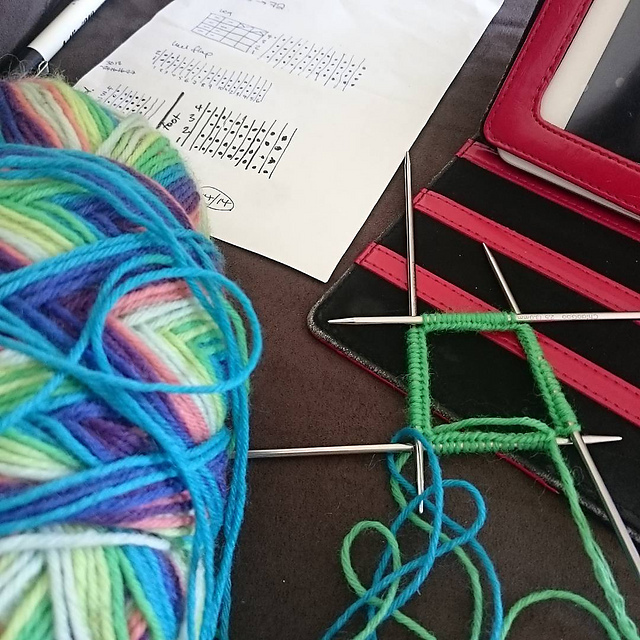 I find it very difficult to pick up stitches that I accidentally drop, or need to redo because the needles don’t have a hook on the end! I’ve had to use a tiny hook a few times now to try and fix up knitting errors. 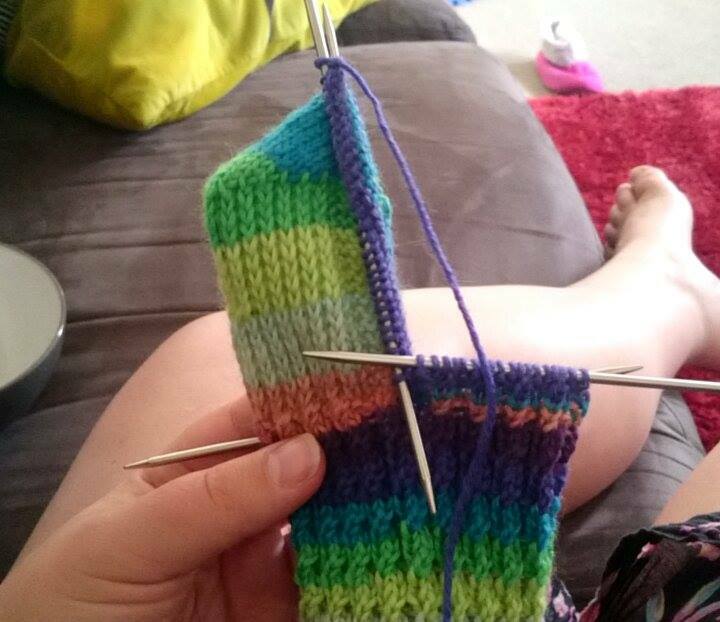 I also don’t like the how I feel like such a beginner – I knew how to knit and how to purl before this sock – THAT was it. Now I’m attempting baby cables and it’s very VERY slow. Also, knitting with five needles?! I don’t think I could take this kind of project in my handbag and knit on the bus. I’m one square away from finishing my Summer CAL blanket, so I think I’ll put the sock down for a week or so to finish off that big project.